American Horror Story’s title screens offer vague hints to important plot elements and events that compose each season. For Murder House, [Ryan] Murphy described the sequence as a mini-mystery and stated that “By the time you see the ninth episode of this season, every image in that title sequence will be explained,” establishing the purpose of the title sequence for future seasons. I loved the show and was eager to watch season two. In case you haven’t watched it, each season is a new story, so unlike most TV shows you don’t have to watch every season to know what’s going on. Murder House and Asylum were two completely different genres and I wasn’t disappointed with either. I have to admit, I PVRed season 3, Coven, but really haven’t been motivated to watch it. Why? I think because the storyline revolves around witches, which aren’t really my thing. I was excited when I heard a fourth season was being ordered by the networks and desperately hoped it would incorporate vampires. So I don’t have to tell you I was disappointed when I heard the new season was called Freak Show. On Wednesday morning, I was checking my Facebook notifications and noticed Anthony had mentioned me in a comment: “Erin Chapman, you were wondering when vamps would turn up…” To my delight someone had shared an American Horror Story clip—with a vampire! And not just any vampire, folks: it was Cher! The video, titled “American Horror Story: Freak Show – Cher,” had been uploaded to YouTube by “Cherilyn” on August 24, 2014. Its description read, “Premiering October 8th on FX!” Did I finally get my wish? Vampire goodness entwined with American Horror Story gore? This required further investigation. To begin with, the trailer has not been acknowledged by the new, FX, or even Ryan Murphy, so that’s one reason it could be fake. Another is that if Cher is indeed appearing in the trailer, it means that she has probably already been cast, and we’ve not heard anything about casting news either. When Stevie Nicks was cast on last year’s season of ‘Coven’, Ryan Murphy couldn’t wait to tell us about the casting news, and he’s done the same this year with any other new castings. Why wouldn’t he tell us about Cher? And, the biggest pointer to this video being fake is that none of the cast members are ever featured in teaser trailers. Unfortunately, cast members aren’t featured in the teasers, which is the biggest accounting factor to this trailer being fake. I knew I needed to dig a little further. Anthony jumped on board with his detective skills. 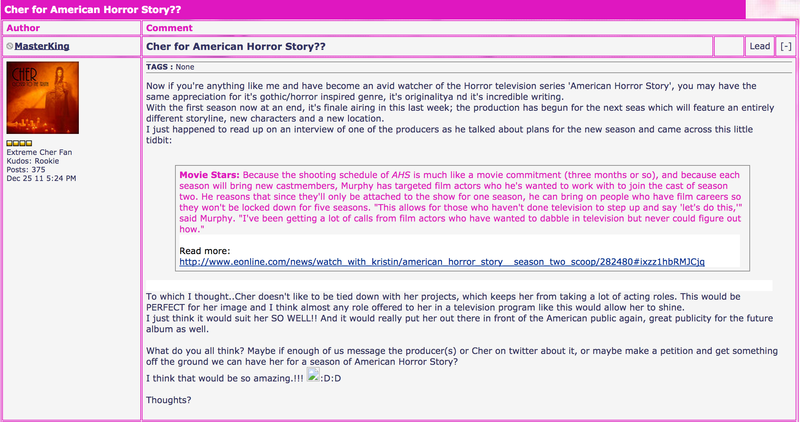 He located a video uploaded to YouTube on June 23, 2014 by PabloMosqueraCover: “American Horror Story – New Teaser Complete Ft. Cher Becomes Like a Vampire.” Its description read: “Cher could be an actress more inside a vampire movie….” and “a Maleficent Cher…” Notice the title says “teaser”—and it was published prior Cherilyn’s August 24, 2014 upload. Fortunately, most coverage was much more cautious—especially as many had clearly been burned by other fake American Horror Story teasers. Dan Avery wrote, “We’re not gonna attest to the authenticity of any of these American Horror Story: Freak Show teaser trailers—especially not after we got burned by the fake “Fallen Angel” clip—but they’re a trip either way” in his NewNextNow article, “Cher Takes a Bite of “American Horror Story: Freak Show” in New Teaser Trailer: WATCH” (August 25, 2014). “American Horror Story” has a long history of fake trailers and promotional images that look real and accurately mimic the style of the promotional material creators. There wasn’t early release that showed an angel in a carnival show opening her wings, then showed someone behind her manually opening the fake wings in a creepy way. However, other writers were much more blunt. Stefano states “È sicuramente un fake” (“It is definitely fake”) in his dituttounpop article, “Cher e American Horror Story? Bufala o verità?” (August 26, 2014), but also expressed enthusiasm for the idea, noting the show’s camp qualities and her potential presence giving the world’s GBLT community a reason to watch the fourth season. So, if the clip is fake, where did the Vampire Cher footage come from? Where did the rumours originate? Part of the mystery was solved by some of the Internet’s most reviled citizens: YouTube commenters. Cher launched her new “Dressed to Kill” tour on March 22, 2014, marking the release of her 25th studio album, Closer to the Truth, in Phoenix, Arizona. The tour’s supposed to finish up on November, 19, 2014; however, it looks like the singer has come down with an “acute viral infection,” as attested by news stories like Christie D’Zurilla’s LA Times article, “Cher Is Sick with a Virus, Postpones Two ‘Dressed to Kill’ Shows” (September 9, 2014, 6:15 p.m.). The vampire “bit” is verified by Philip Beadle and Spartan Daily Contributor’s Spartan Daily article, “Music Icons Heat Up Summer with Unforgettable Performances” (August 26, 2014, 12:30 p.m.), who mention Cher performed her song “Dressed to Kill” this summer, wearing Medieval vampire get up. So, that solves the mystery: the American Horror Story “teasers” are actually snippets from vampire footage used on her “Dressed to Kill” tour, re-branded with the show’s title credits. Another in a long line of fan-made trailers. I can now officially say I am disappointed. Oh, and just for the record, Cher is okay, but I’m not a huge fan. I would have been content with any vampires, even if it was Cher. Nonetheless, I was still left wondering: how did Cher come to be associated with American Horror Story in the first place? Christina Galanopoulou addressed apparent rumours of Cher’s appearance on the fourth season of American Horror Story and an “official page on Facebook” dedicated to pushing for her appearance on the show in her JoyTv article, “American Horror Story 4: H Cher εισβάλλει στο Freak Show – Φήμες και για guest της Lady Gaga” (May 21, 2014). 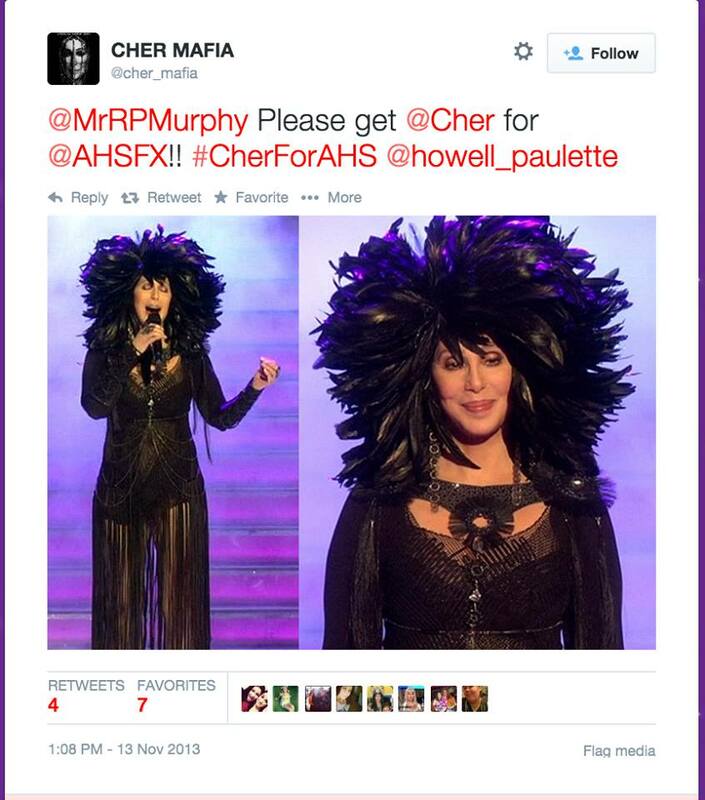 It featured a photo of Cher dressed as a witch, with a “#CherForAHS” hashtag emblazoned on it. 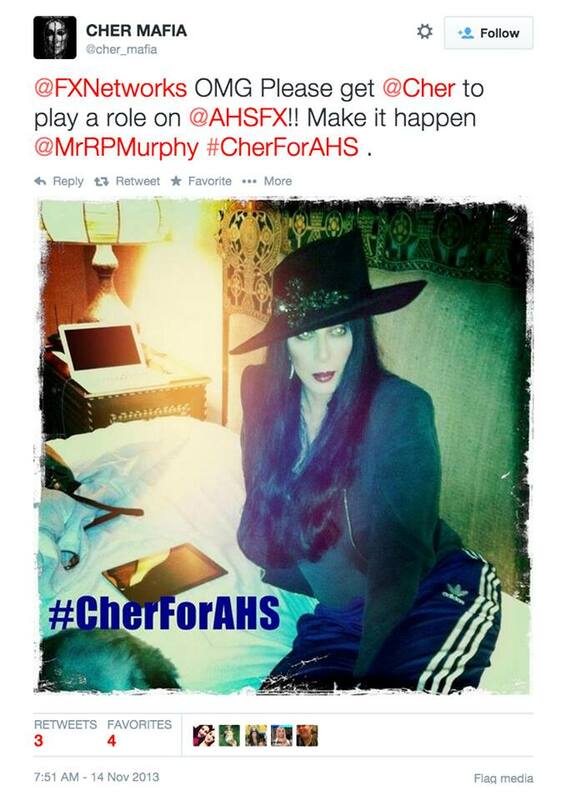 The Facebook page is called “Cher for American Horror Story.” As of today, it has 159 likes; but it’s far from an official page: its “About” page reads: “Would be a Dream come true for SO MANY fans! Let’s make it happen!” The page gives its join date as December 16, 2010, but its first entry—for the page’s cover photo—was November 14, 2013. That means the page’s creator wanted to get the ball rolling early—or, its mission was decided much later. In light of the 3 year gap between posts, the second option is much more likely. 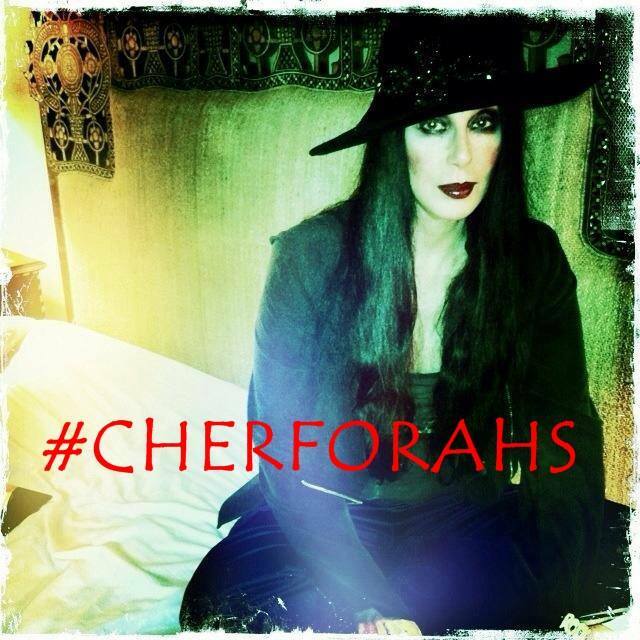 To double-check, Anthony contacted the administrator of the “Cher for American Horror Story” page today, and was told: “That’s because I ran the page under a different name until November 2013. There are no older postst [sic]” and “It was just a private page I ran under my own name“. There we go. One mystery solved. Where did the hashtag come from, then? Though it features on the page’s cover photo and a bunch of pics (including the witch one) in its November 19, 2013 post, it didn’t originate there. Believe or not, it actually originated with the Mafia. The Cher Mafia, that is. Hashtags are commonly associated with Twitter posts. As Elizabeth Kricfalusi elaborates in her Tech for Luddites article, “The Twitter Hashtag: What Is It and How Do You Use It?” (August 24, 2014), “A hashtag is simply a way for people to search for tweets that have a common topic.” From there, it was only a matter of typing the hashtag featured in Christina Galanopoulou’s article and voila! Have you heard about the ongoing rumors that Cher (yes, THE Cher) is negotiating with the producers about a major role in season four? 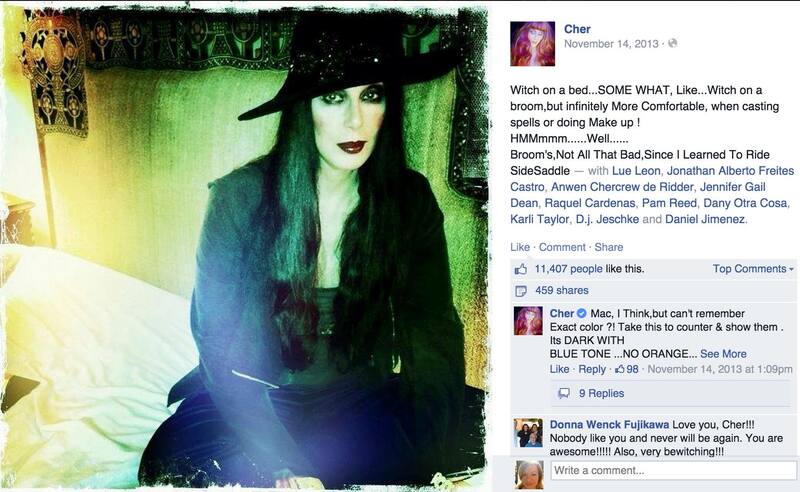 Well aware of all the hype, she posted a picture of herself dressed up as a witch just yesterday on her official Facebook page. MasterKing’s idea was inspired by an earlier article, Jenna Mullins’ “American Horror Story Season Two Scoop: New House and (Mostly) New Faces,” (E! Online, December 22, 2011, 12:32 p.m. PST) where the show’s creators discuss the possibility of recruiting film stars for roles, due to the relatively short amount of time they’d be needed, meaning it’d be less constricting to their busy schedules. Ah, Santiago! We meet again! After some brief exchanges, he returned to the page by sharing Cherilyn’s fake YouTube teaser, American Horror Story: Freak Show – Cher,” on August 24, 2014, 10:34 a.m. How the wheel turns. While researching this article, I tweeted Cher on September 17. Just for fun—not that I expect a response, but worth a shot, right? Especially in hopes of getting an actual confirmation. As of this writing this, I’ve received no response. But you never know. I once tweeted one of the cast of Supernatural and got a tweet back! American Horror Story: Freak Show premieres on FX, October 8, 2014, 10 p. m. (check local listings)—without Cher—and sadly without any vampires this season (that I know of). Oh well, keeping my fingers crossed for season 5! In case you read this, that is a big hint creators Ryan Murphy and Brad Falchuk! I’d also like to give Anthony major props for additional research assistance and contributions to this article. Aw, schucks. ‘Twas nothin’! As it happens, I uncovered an interesting Cher-vampire connection while assisting the research of this thing—but I’ll discuss that in another article. In the meantime, if you’re interested in another example of “telephone” in the media, read my article about the lady who married a Robert Pattison cardboard cut-out. Yes, seriously.